Anyone who knows me has already heard my opinion that the Livescribe Pulse Pen is my single most useful gadget. I am a note taker, partly as a method for managing my ADD, but mostly as a record of what was said and agreed in meeting and to capture my thoughts before I lose them. For years I said I would scan my notes and organize them. Of course, I never did any such thing. I finally decided to look for some way to do this with the least amount of effort (again, my laziness comes to the rescue). After much searching and reading many reviews, I made the investment to buy a Livescribe Pulse Pen. I know there are other devices that claim to perform the same functionality, but the Livescribe pen seemed to fit my requirements best. Now that I have used it for over a year, I can tell you that I am probably one of the largest fans and tell people about it all the time. Livescribe has a newer Echo pen, which seems to be more ergonomic and has a standard USB connector, versus the docking station for the Pulse pen. Easy to save and search notes: I take notes during the day and download them simply at the end of the day, but putting the pen into its docking station, which also recharges it. Any new notes (an audio – see below) are automatically downloaded to my hard drive. This includes any updates I may have made on previous pages. Now, for the icing on the cake – these notes can be searched quickly without going through an OCR process. Yes, the Livescribe desktop software searches your handwritten notes, which is amazing for anyone who has seen my handwriting. Audio recording: If you wish, you can easily record audio while you are taking your notes. I find this handy when I go to conferences or attend meetings. I recently attended a 3-day retirement seminar and recorded the full three days along with my notes. The best part is that you can play back any part of the recording by simply tapping you pen (or clicking your mouse) on your note and the pen (or computer) will play back what was said while you were taking that note. Create PDF or Pencast of notes: You can create a PDF copy of selected pages from your notes to send to colleagues. If you recorded audio with the notes, Livescribe can create a “pencast” version of the notes to synchronize the audio with your notes. Many options on notebook formats: As you can see from my photo above, notebooks are available in many formats. You must use Livescribe notebooks since the paper is covered with nearly invisible dots that are used by the pen to record, but the good news is that these notebooks cost about the same as similar non-Livescribe products. I have books ranging from my pocket flip-pad to 8.5×11 sprial pads, and everything in between. I have only two complaints. First, the pen cartridges are small and tend to run dry at the most inconvenient times. I carry spares with me to make sure I am not caught unprepared again. Second, the pen is fairly fat and slippery. This does not normally bother me, but can be difficult when my hands are dry and cannot grip the pen. Also, the pen will roll away if you are not careful when you put it down. I think Livescribe has fixed this problem with the Echo pen. I have taken copious notes for over a year with significant audio content. I still have nearly half of the 2GB left, so I cannot see storage becoming a problem. Of course, Livescribe offers many Apps for the pen, but I have not found a need to buy any yet. They are also fully compatible with Evernote for those who want to manage their media on the web. I could go on for a long time, but will stop here. If you have any questions or wish further information, please submit a comment below and I will respond promptly. 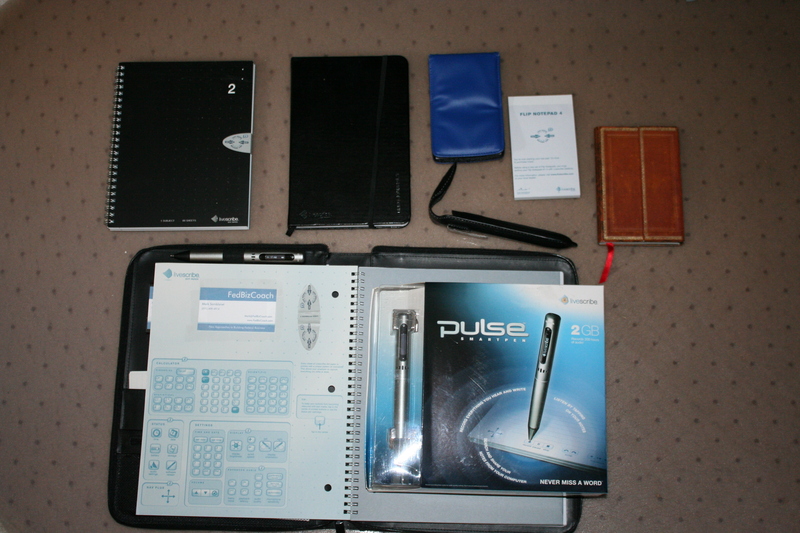 Posted on October 3, 2011, in Cool gadget and tagged cool gadgets, livescribe, pulse pen, record your writing. Bookmark the permalink. 6 Comments. who has shared this great editorial at here. Craig: You can always get to the home page by clicking on the FedBizCoach logo at the top or the Game Plan tab. Does this answer your question? Question – I clicked the link in the e-mail, I read the post. Now how do I go to your home page from here without having to rember what the URL is and typing it in?